Listing apartment buildings for sale, or any commercial property for that matter, can be a grueling and time-consuming task. And, as a broker or agent, who has time to perform the research on the best sites, input all the listing details, and monitor the traffic? You want to get your listing in front of as many interested buyers as possible, and you want it done now. So, where can you go? The Internet has obviously created a huge space for selling and buying apartment buildings. And, with all the websites involved in listing and selling commercial real estate properties, how can you choose? Luckily, the team at The Robert Weiler Company has combed the web in search for the best sites to list your property, whether it is an apartment building or warehouse space for rent. Here are four fantastic and free tools to get the job done. Boasting five million unique visitors per month, LoopNet is the largest network for commercial real estate, from a small rental space for lease to an apartment complex for sale. LoopNet is also one of the oldest CRE marketplaces on the Internet, established in 1995. Today, it is owned by CoStar Group, which also owns similar platforms such as Showcase and CityFeet, in addition to Apartments.com. Access to over 800,000 listings and daily email alerts on commercial properties, such as warehouse space for rent, office buildings for sale, and more. As you can imagine, LoopNet also has several listing features for premium members, which come at an added cost for members. 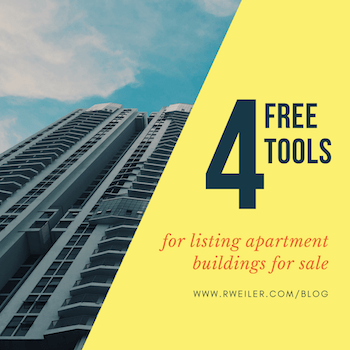 When you think of apartment buildings for sale, you may not consider the same platform that also includes personal ads, garage sales, and job listings. Surprisingly, Craigslist has become an excellent channel for your commercial property listings with thousands added daily. Founded in 1995, Craigslist was the “first of its kind” on the Internet – a website dedicated solely to traditional classified advertisements. Indicate your specific area, depending upon your state. Preview your ad and continue to initiate a confirmation email. Once you receive the confirmation email, click on the embedded link. You will be directed to a screen asking you to accept Craigslist’s terms of service. Realtor.com is the official website of the National Association of REALTORS® and has access to over 800 multiple listing services. If the name doesn’t tell you everything, Realtor.com has approximately 3 million listings for every type of property imaginable. Buying an apartment complex is a major investment. So, why is Realtor.com a great place to post your listing? First and foremost, purchasers will turn to a reliable source, particularly one owned by one of the most trusted associations in the industry. Furthermore, since the site includes everything an investor or Columbus realtor might want, they are likely to stay on the site longer; thus, increasing the chances that they’ll find your listing. Realtor.com’s “Essentials” solution provides a free tool to manage your profile, your leads, and your listings. Not to mention, you don’t need to be a member of the National Association of REALTORS® to register. Check out their site to access the free sign-up form and further explanation of their introductory features. Founded in 2002 by a New York real estate investor and programmer, the website currently boasts 90 million property listings. For commercial real estate agents and brokers seeking to list their apartment buildings for sale, it is completely free to list on PropertyShark.com. The focus of the site is providing people with property records, which include the owner’s name, address, taxes, square footage, and purchase price. Anyone who is serious about buying your property will want to see this, so it is a useful tool that will help you make the sale. Select “For Sale/Lease” on the website’s main menu. Choose “Post a New Ad” on the drop-down menu. Find the address of the property by using the search tool. Pick whether the listing is a sale or lease. Insert the information for your listing including the property type, description, and agent details. This site provides highly detailed information on the neighborhood in which you are selling your property. People can find out the demographics, recent sales data, and even the height of nearby buildings. This knowledge is incredibly useful for someone who is thinking of a rental space for lease or owning and operating an apartment building. The quicker prospects can obtain these facts, the quicker they can express an interest in your property. Who Can We Turn to for Help in Listing My Commercial Property? In commercial real estate, it is not only about who you know, but what you know. That’s why building owners, land developers, and investors have crossed the threshold of The Robert Weiler Company offices on High Street in Columbus, Ohio. We have almost 80 years of industry experience as brokers, property managers, developers, appraisers, and consultants. And, we are prepared to assist you with your next listing, whether it be apartment buildings for sale or another form of commercial real estate. Our expert advice is waiting for you at 614-221-4286.